ACU provost Dr. Robert Rhodes joined the administration at the start of the 2012-13 school year following a 17-year career at New Mexico State University as associate dean for students and programs in NMSU’s College of Education. He has a bachelor’s degree from Oklahoma Christian University and a doctorate from the University of Northern Colorado. 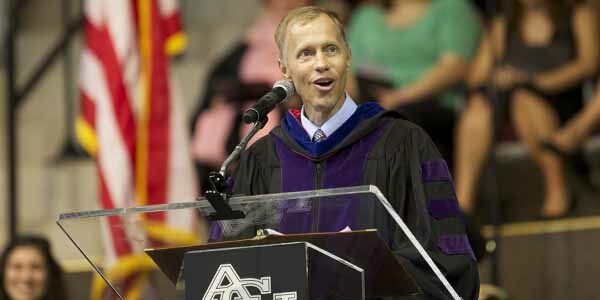 In his second year in Abilene, he reflects on ACU’s academics, faculty and his role. What initially attracted you to ACU? I was attracted to ACU because of the unique place this university holds among Church-of-Christ-affiliated universities and Christian higher education. ACU has a long-standing reputation as an institution that is both fully committed to its reason for being and willing to explore new ways of delivering transformative educational experiences to students. This rare combination of heritage and high energy was attractive to me as I considered applying for the position of provost. What have you learned about the university as you reflect on your transition, one year later? One year later, I have learned that ACU is full of remarkably talented faculty and staff. I have been consistently impressed with the quiet and humble excellence present in the work of so many different individuals. There are faculty and staff in every college and program who would be successful wherever they chose to work but who have made ACU their professional home because of their dedication to our mission. This spirit permeates so much of what takes place here that after a period of time it begins to seem normal. I have to remind myself sometimes of how unusual it really is. What can you tell us about some unexpected challenges and blessings you have experienced? ACU is not immune from the industry-wide challenges that all of higher education is currently facing. The increased levels of competition for students and the high cost of delivering a quality education have a profound impact on the educational and financial decisions we make. While these challenges aren’t a surprise, the number of related decisions and plans that we have made during my first year were more than I anticipated during my “honeymoon”. Out of this, however, has come the unexpected blessing of ready assistance and support. I have had more trust bestowed and barriers removed than any new arrival could expect or deserve. What are some of the unique challenges of leading the academic side of the university? The breadth and depth of our colleges, departments and programs means there is always more going on than I can keep pace with individually. Communication and collaboration are two key elements of this position. I have a great administrative team and am blessed by a group of deans who are a joy to work with and who fully embrace the hard work we are about each day. Time is probably my greatest challenge. I enjoy spending time with students and faculty, and I have to carefully manage my schedule for that to happen in any meaningful way. I’m still working on that. Oddly enough, I enjoy the problem solving that comes about from tackling the expected and unexpected things that come up. This is usually done as a team, and the insights and solutions that arise are often surprising. I also enjoy seeing students being molded before my eyes through all that happens here on campus, down the road in Dallas, and around the world as part of the work we do in our corner of the Kingdom. How do you describe ACU to potential new faculty members? I tell students and new faculty members the same thing: There are many places where you can receive a quality education. There are fewer, but still several, places where you can be formed spiritually during your undergraduate or graduate experience. There are very few places that do both at a high level (probably 10 or less), and ACU is one of them. When we talk about ACU being no ordinary college or university, I believe this is a large part of what we are describing. My desire for new faculty members is for them to be able to live out their calling here to such a level that they are known in their field and in higher education, that they are sought after by industry and institutions, and that they choose to spend their career at ACU because this is the place where high quality education and spiritual formation meet. How is technology changing the academic offerings of the university? I think ACU has been in the educational technology business long enough to have a healthy perspective on this issue. We have developed extensive online course offerings for graduate students and a smaller but growing number for undergraduate students. Some classes fit an online format very well and others do not. We have taken a similar approach to our use of iPads as an instructional tool. There are enough key applications and creative uses inside and outside of the classroom that we feel every student needs access to an iPad in the same way they need access to textbooks. At the same time, not every course or subject is made better by this type of device. I feel we are highly invested but discerning consumers. One of the most exciting uses of technology happening on campus currently is the new Maker Lab in the Brown Library. A partnership between the Department of Engineering and Physics and the library, this creative space is accessible to all majors and includes high-end tools such as an industrial-grade 3D printer, laser cutter, and laser router. To my knowledge, we are the first university to provide such broad technological access to a large number of students. What are some of the significant themes or conversation topics you see emerging among ACU’s faculty? At ACU we are at the intersection of higher education and the church, and our conversations reflect this reality. As the constituency we serve continues to change incrementally but steadily, we are seeking ways to continue to connect deeply to our heritage within Churches of Christ while also serving an increasingly diverse population of students and churches who are attracted by the product we offer. We take seriously our responsibility of stewardship and are always looking for meaningful ways to serve the students, families and churches with whom we are associated. I am convinced our greatest success will come through serving well the needs that exist across the spectrum of Churches of Christ today. Which upcoming academic initiatives or projects at ACU are you particularly excited about, and why? I am very excited about our ACU at CitySquare partnerships. The location, shared mission, and innovative possibilities really couldn’t be better. I have loved being part of this process from the early stages of ideas on a white board to new program development. Most exciting, though, are the responses of our students. They are hungry for this type of real service embedded in educational programming and are teaching us things we can bring back to campus here in Abilene. Tell us a little bit about your family. How have they adjusted to relocating from New Mexico to Texas? Our relocation from New Mexico to Texas has been remarkably smooth. We spent time each year at a family place in the Texas Panhandle, but no one in our family other than me had lived in Texas. Our son, Josh, is a senior at Wylie High School and was able to integrate quickly through basketball and the youth group. Our youngest daughter, Julia, is in eighth grade at Wylie Junior High and has a special education classroom setting that has been a good fit for her needs. Our oldest daughter, Jessica, is a junior at Pepperdine University, and she has enjoyed spending summers here in Abilene with the family. We are members at Southern Hills Church of Christ and already feel at home there. Elena and I have commented on several occasions how evident God’s hand has been in this move. View more from Wendy Kilmer.